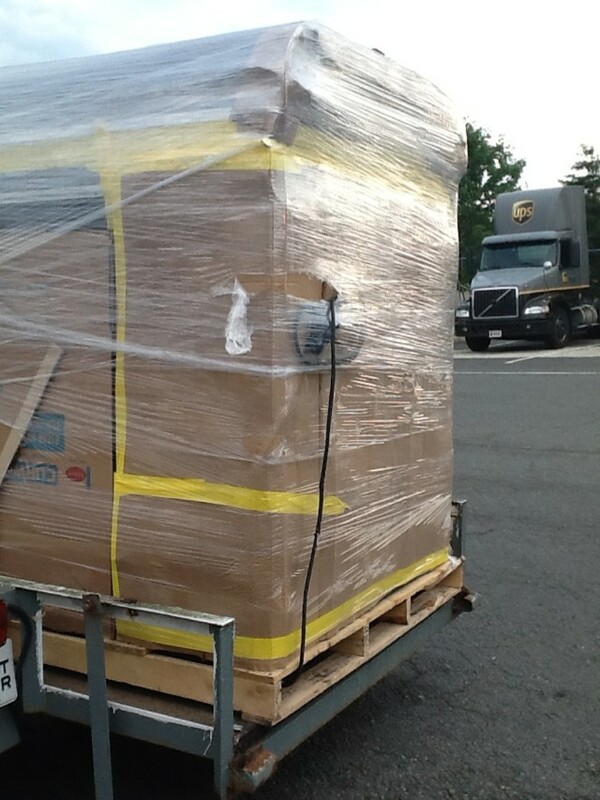 I picked up my trailer cap birthday present from the UPS freight depot yesterday evening. 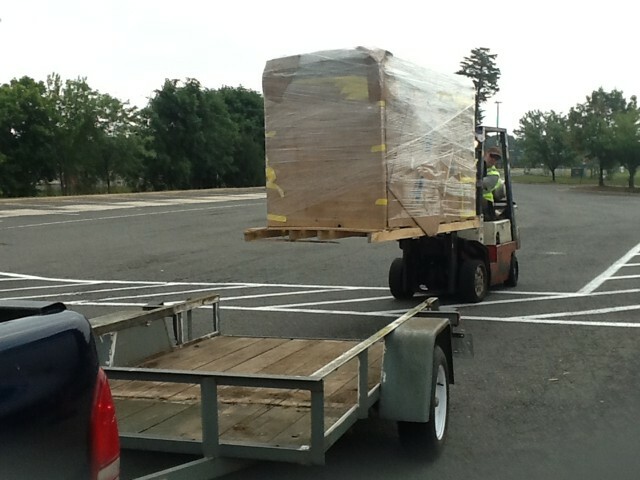 It came nicely wrapped on a pallet, though oddly, the electrical cord was left sticking out (and got damaged). 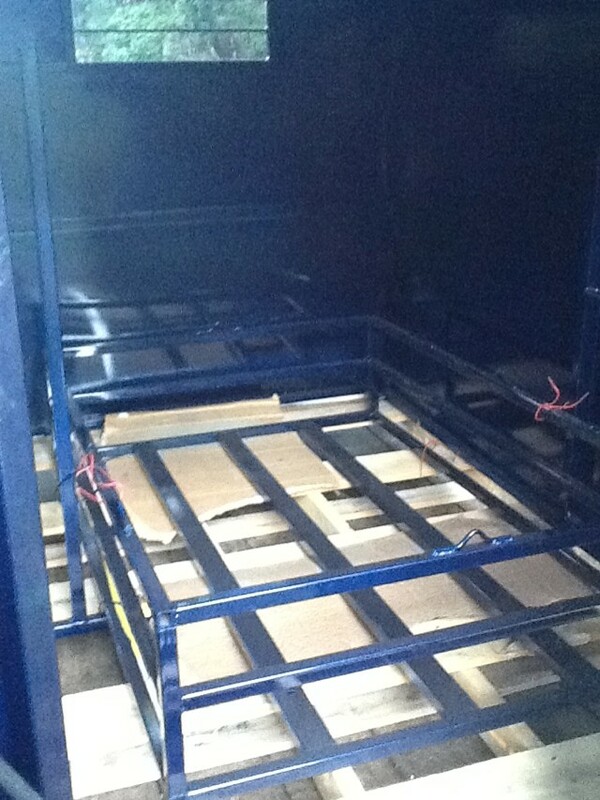 The UPS guys put the pallet directly onto my recently-vacated-by-the-goat-box trailer bed, and I trundled it home. Once Achaosofkittens came home, we unwrapped and examined it. 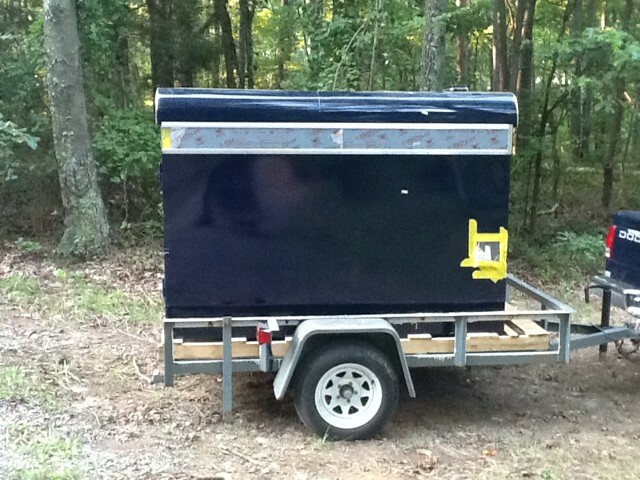 We still need to mount it to the trailer bed and put its hay rack hat on, but ... A trailer! And it's blue! Yay! A box! Just what I always wanted! Ooooooh, shiny! The light grey stripes are plexiglass windows (still covered in shipping protectors) that slide out for ventilation. There is also a pop-top vent as well that you can't see in these pictures. The yellow tape is holding the hardware to mount the hay rack where we can't lose it. It has loading lights both inside and outside the door that power off of the truck from the same jack as the trailer lights. So I can have loading lights or trailer signal lights, but not both. That's ok, really since I can't see loading while moving. 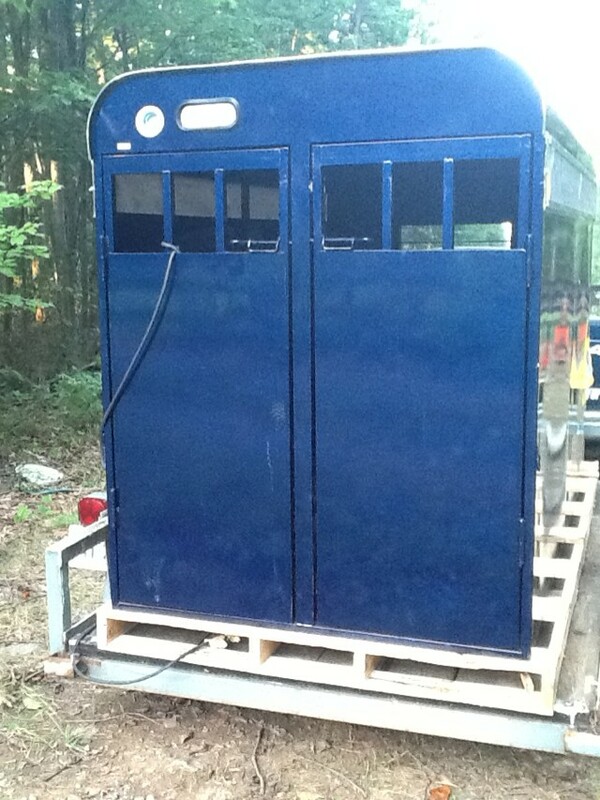 This is the hay box that will mount on top of the trailer. 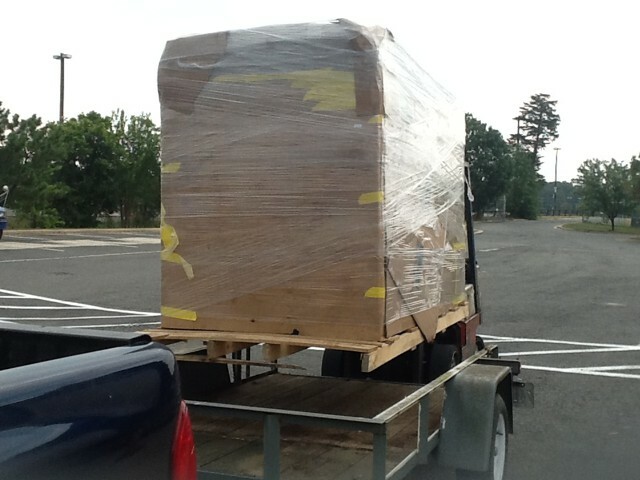 They shipped it inside the trailer so that it wouldn't get bent and to make the wrapping job easier. You can also see the left frame of the internal swing gate. We've already noticed that there are some odd things about how it was constructed and shipped, but I have a very handy Achaosofkittens who can fix and change some of it. ... Shipping damage that we've noticed so far includes both the electrical cord getting scraped raw and the wingnut for removing the right sliding windows being broken off. Construction oddities basically center around the trailer not being built to take goat-induced damage. For example, look at the photo that shows the rear trailer lights, and then look up at the left edge of the nifty curving roof where it overhangs the edges of the walls. The corners of the overhang are just low enough to scratch the rear doors when the doors are opened all the way (i.e. slammed open). Another example is where the latches on the rear doors are located. They are very high (in the windows), and almost parallel with the upper hinges. Where would an angry/bored goat be [repeatedly] hitting the door? About two feet lower, where there is only a hinge on one side but no center reinforcement on the door. Thank you! Yes, it's a very happy birthday box. My happybirthdaymonth continues to live up to expectations! It's really neat! And and and it is blue!!!! Wow that is super awesome! I don't think I've ever seen something like this! II might have to try to make one myself! The company is LoPro Trailers out of Oklahoma. They are very inexpensive for a very nice produce that is custom-painted to your colors. You might consider pricing something out from them before going it alone, if only because metal is obnoxious to weld at home. I however do not find welding metal to be obnoxious; I do it all the time and quite enjoy it! Once again, your presents rock. Happy Birthday Month...what are you doing to cap it off?